Sprinkle seed around the area in which you intend to place the trap for a few days so that the bird returns frequently to that location. Stay nearby when the pigeon is eating the seed so it gets used to your presence. Cut a 6-by-6-inch flap in the top of a cardboard box using box cutters or scissors. This flap will be used as a door to remove the pigeon once it has been trapped. 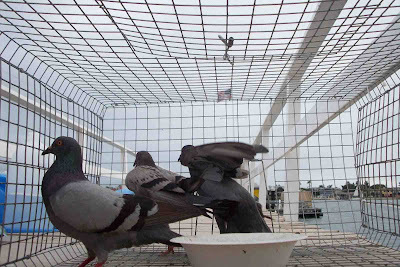 The size of the box does not matter so long as it is large enough to accommodate the trapped pigeon. A box measuring at least 12 inches square will be sufficient. Affix a block weight or heavy object to the top of the box on one side. The weight will serve to drop the end of the box quickly when the stick propping it up is pulled away. Prop up the weighted end of the box with a stick approximately 10 or 12 inches long. Use something light weight, like a paint-mixing stick, so it does not injure the pigeon if it falls inside the box. Tie a length of string to the stick and bait the area with seed. Sprinkle some seed under the box and outside it near the stick, where the pigeon can see it. Wait for the pigeon to follow the trail of seed and to walk under the box, then yank the string to pull the stick away, causing the box to fall down and trap the pigeon. Position yourself about 20 feet away from the box so you do not deter the pigeon from coming near the box. Retrieve the bird from the trap by opening the flap door cut in the top and remove the pigeon. Wear thick gloves during this process to protect your hands from the pigeon's sharp beak. Cut a window in the side of a large cardboard box. The size of the box does not matter, but if you plan to catch more than one pigeon, it should be at least the size of a file-storage box. The opening in the side of the box should be about 8 inches high and at least 4 inches wide. You may make the opening longer than 4 inches if you choose. Cut several 10-inch lengths of wire using wire cutters. Affix the lengths of wire vertically to the inside of the box, spacing them out every 1 1/2 inches along the cut out window. Secure the wires in place with hot glue at both ends, and then stretch a piece of duct tape across all of the wires inside the box to hold them in place. Bait the trap by sprinkling bird seed inside and around the trap. 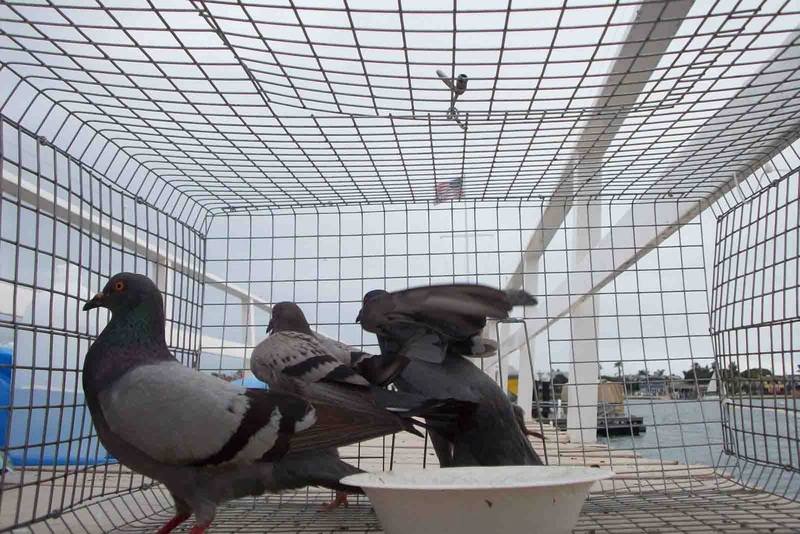 The pigeons will push through the wire to get to the seed inside the box and, after the pigeons push through, the wire will return to its original shape and prevent the birds from leaving the box. They don't make so much of a mess as we do Saleem. What happens to the pigeons once caught? You are an idiot! Pigeons are intelligent and loving birds and they do not have sharp beaks! Trapping these birds is going to cause baby birds to die of starvation..illegal in the UK. Rest assured that I'm going to report you to your local authority, you horrible excuse of a man!! YOU ARE THE IDIOT, KAY OUNSWORTH!!!!!!! !